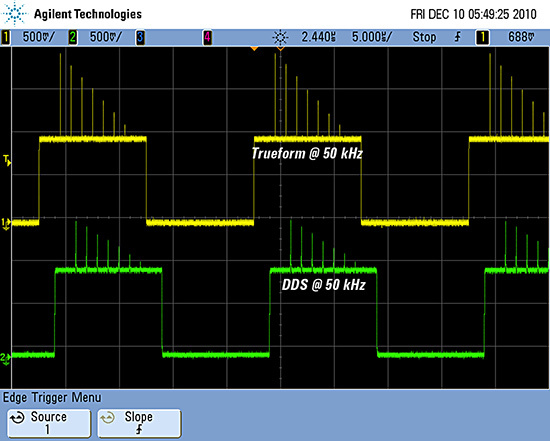 Trueform waveform generation technology is an exclusive technology found in Keysight's 33600A and 33500B Series Trueform waveform generators. Trueform technology provides measurable advantages over Direct Digital Synthesis (DDS), the previous generation technology used in function/arbitrary waveform generators. These advantages include signiﬁcantly lower waveform jitter for less test uncertainty and a true representation of the selected waveform, not an approximation. In this overview, we will introduce you to Trueform technology and compare Trueform to Point-Per-Clock (PPC) and DDS technology for waveform generation. Conceptually, the simplest way to gen­erate a waveform is to store its points in memory and then read those points out one after another and clock them into a data acquisition module (DAC). After the last point has been read, the generator jumps back to the ﬁrst point again to begin the next cycle. This is sometimes called PPC generation. Even though this method seems like the most intuitive way to create waveforms, it has two significant drawbacks. First, to change the waveform's frequency or sample rate, the clock frequency has to change, and making a good low-noise variable-frequency clock adds cost and complexity to the instrument. Second, since the step­wise output of the DAC is undesirable in most applications, complex analog ﬁltering is needed to smooth the steps out. Because of its complexity and cost, this technology is used mainly in high-end waveform generators. DDS uses a ﬁxed-frequency clock and a simpler ﬁltering scheme, so it's less expensive than the PPC method. In DDS, a phase accumulator adds an increment to its output in every clock cycle, and the accumulator's output represents the phase of the waveform. The output frequency is proportional to the increment, so it's easy to change frequency even though the clock frequency is ﬁxed. The output of the accumulator is converted from phase data into amplitude data typically by passing it through some type of look-up table. The phase accumulator design allows DDS to use a ﬁxed clock, but still execute waveforms at a perceived faster sample rate than the clock. So with DDS, not every individual point is being expressed in the resulting output waveform. In other words, DDS is not using every point in waveform memory, but it creates a really good approximation. But since it is an approximation, waveform data is changed in some way. DDS can skip and/or repeat aspects of the waveform in an unpredictable way. In best-case scenarios, this leads to added jitter; in worst-case scenarios, severe distortion can result. Small features in the waveform can be partly or completely skipped over. Keysight's Trueform technology represents the next advancement in waveform generation technology. Trueform provides the best of both worlds. It gives you a predictable low-noise waveform with no skipped waveform points like PPC technology, but at the price point of DDS tech­nology. Trueform works by employing a patented virtual variable clock with advanced filtering techniques that track the sample rate of the waveform. 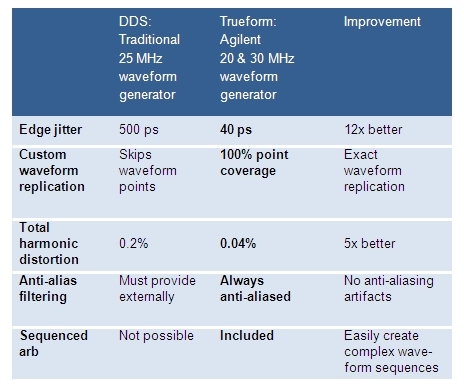 In the following sections, we will look at some of the waveform generation advantages Trueform provides over DDS. 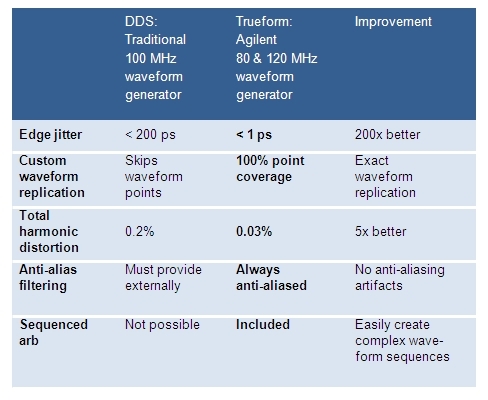 One of the key advantages Trueform provides over DDS is overall better signal integrity. You can see the advantage in the frequency domain by comparing spectra and the time domain with a jitter measurement comparison. Figure 1 shows a frequency domain view of a 10 MHz sine wave generated using Trueform technology. 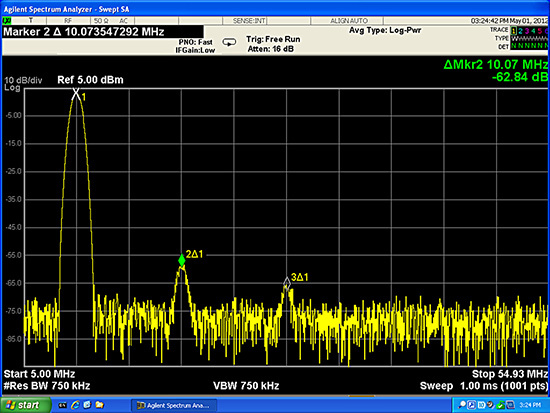 Figure 2 shows the same frequency domain view of a 10 MHz sine wave generated with DDS technology. Ideally, a sine wave would consist of the fundamental frequency with no harmonics, but in the real world this does not happen, so you want the harmonics to be as small as possible. In both Figures 2 and 3, in the upper right corner of the screen you can see how many dB the second harmonic is from the fundamental frequency. You can see the Trueform second harmonic is >5 dB lower than the DDS second harmonic. 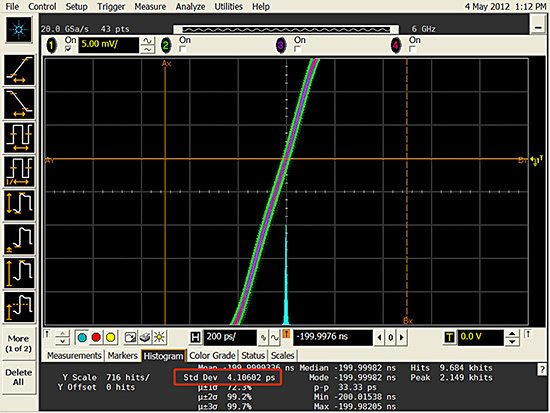 Also on the DDS figure, you can visibly see the fourth and fifth harmonics poking up from the noise floor. 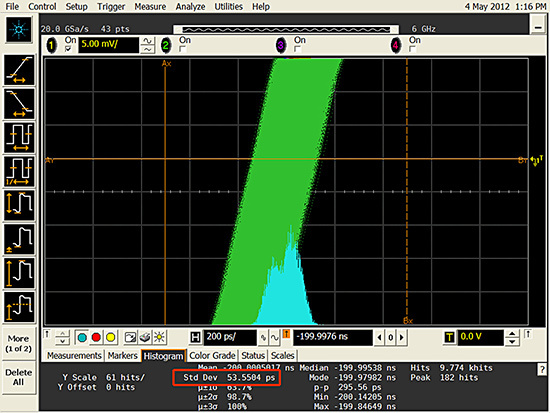 Finally in the DDS Figure 1 you can even see a non-harmonic spur between the fourth and fifth harmonic. When we compare the two from a jitter measurement perspective, the Trueform advantage becomes even more pronounced. 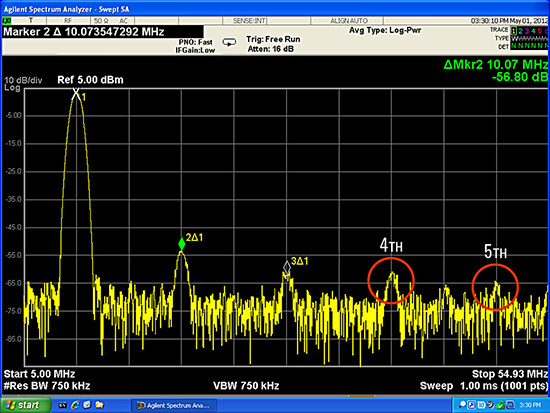 The following figures show a jitter measurement made on a 10 MHz pulse signal using a high-performance oscilloscope. The scope view is zoomed in on the rising edge of the pulse signal with the persistence setting of the scope turned on. The histogram function of the scope is used to measure the period jitter of the signals. The stan­dard deviation measurement in each figure is circled in red and represents the signal's RMS jitter. The Trueform pulse signal Jitter measurement is shown in Figure 3 and the DDS pulse signal jitter measurement is shown in Figure 4. For the Figures 3 and 4, both the amplitude and time scales for the scope are the same. The Trueform pulse waveform has more than 10 times less jitter compared to the DDS pulse waveform. 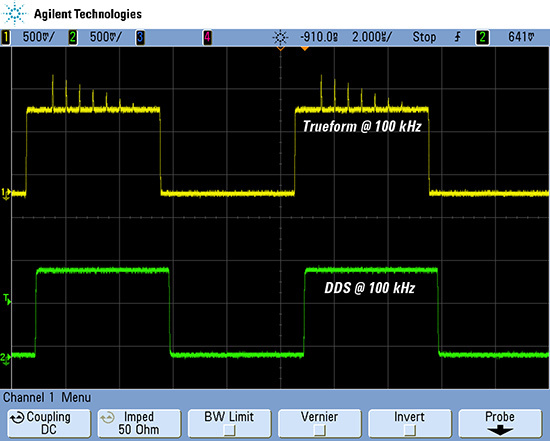 The improved signal integrity Trueform offers over DDS means less uncer­tainty in your tests. This is especially true when you consider edge-based timing applications like generating a clock signal, trigger signal or commu­nication signal. The decreased jitter directly translates into less timing uncertainty in your test. As we mentioned earlier, DDS uses a fixed clock and a phase accumulator so it cannot guarantee that every point or feature in a waveform will be played. The higher the frequency, the more gaps you will see in the output waveform compared to the ideal wave­form. Trueform, on the other hand, plays every waveform point regardless of the set frequency or sample rate. This becomes critical when you are dealing with a waveform that may have a small detail that is critical to the test you are performing. As an example, we created an arbitrary waveform that consisted of a pulse with seven descending amplitude spikes on top of the pulse. The waveform was then loaded into a Trueform waveform generator and a DDS function/arbitrary waveform generator. First the waveform was played at a 50 kHz frequency on each generator. The result was captured on a scope, as shown in Figure 5. 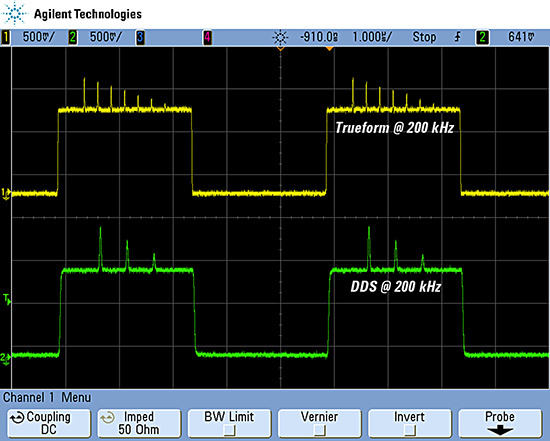 The yellow trace is the Trueform wave­form and the green trace is the DDS waveform. In Figure 5 at 50 kHz, each generator was able to reproduce the waveform with seven spikes on top of the pulse. You can see that the Trueform spikes reached higher amplitude. In the Figure 6 scope screen shot, the waveforms were played again, but this time at 100 kHz. At 100 kHz, the Trueform waveform generator played all seven spikes and the DDS generator did not play any of the spikes. In the Figure 7 scope screen shot, the waveforms were played again, but the frequency was doubled again to 200 kHz. At 200 kHz, once again, the Trueform waveform generator shows all seven spikes in the waveform. The DDS generator went from playing no spikes at 100 kHz to playing three spikes at 200 kHz. Notice that the three spikes played in the 200 kHz waveform do not match the correct time location of any of the seven spikes that are in the actual waveform points. These waveform examples demonstrate that when working with waveforms that have ﬁne detail, DDS cannot be trusted. DDS technology has been the standard technology in previous generation waveform generators, because it offered a lower-cost alternative to high-end PPC technology. The major drawbacks to using DDS technology to generate waveforms are poor signal quality, in the form of jitter and harmonic noise, and skipping waveform points so you do not get a true representation of the programmed waveform. Keysight's patented Trueform technology represents the next advancement in waveform generator technology by providing the performance of PPC at the price of DDS. This means you get low jitter on output waveforms and you get the waveform you want every time. Keysight's Trueform technology blends the best of DDS and PPC architectures, giving you the beneﬁts of both without the limitations of either. Trueform technology uses an exclusive digital sampling technique that delivers unmatched performance at the same low price you are accustomed to with DDS waveform generation. The tables below highlights the revolutionary capabilities of Trueform technology.